The following show you how to create a framework for the OpenGL viewing class. You will need to perform the following steps. Select "New" -> "Project". A dialogue box as below will appear. 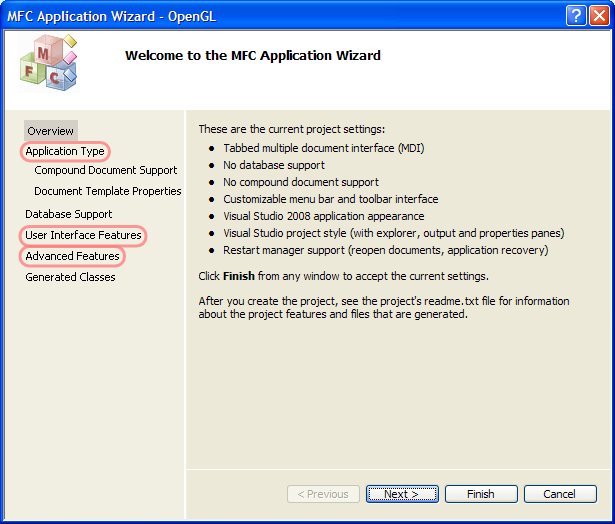 Under the "Project Types:" section on the left, expand the "Visual C++ Projects Folder", and select the "MFC" folder. Under the "Templates:" section on the right, select "MFC Application". In the "Name:" field, type OpenGL. (*note, it is not recommended to work off of the H: drive; you may get strange messages and inconsistencies when you build your project over a network). You will notice that on the left hand side are seven project setting options. The three that you will modify are circled in red. For thoroughness, we will go through all seven options. 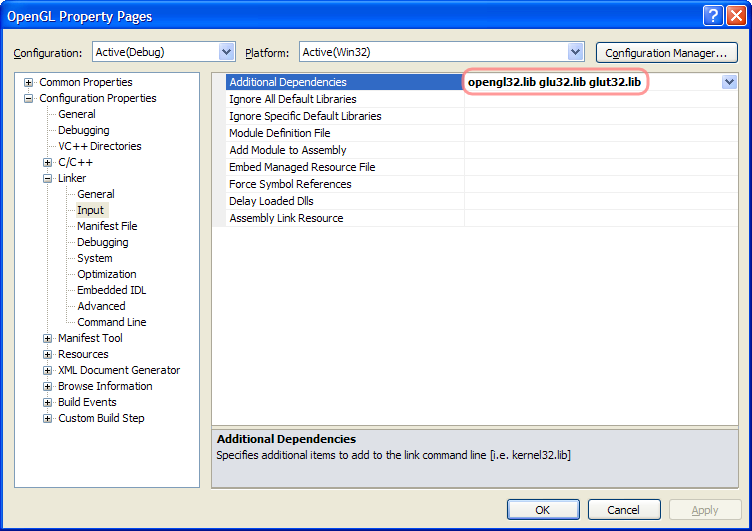 Select "Use MFC in a shared DLL"
At this point, we have created a framework for the OpenGL program we are to develop. Your main window has changed. It now has three main regions. 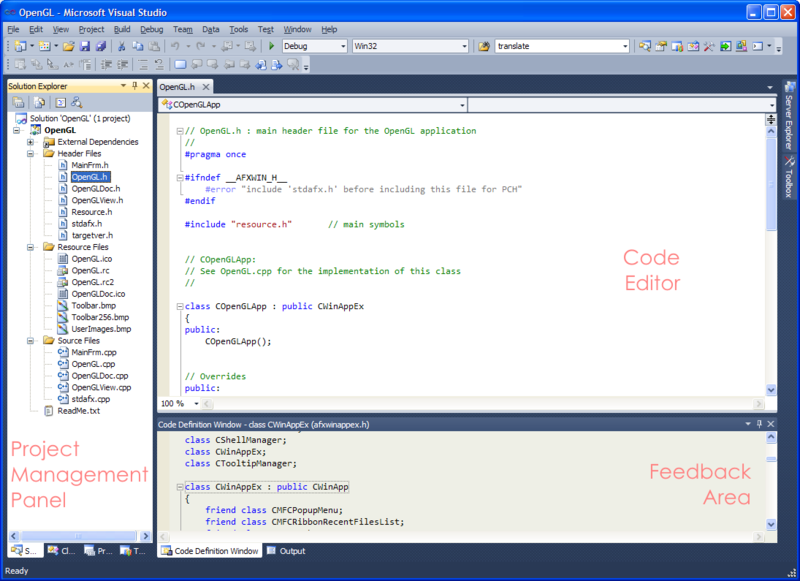 Right Top: Code Editor where you can write and edit your programs. 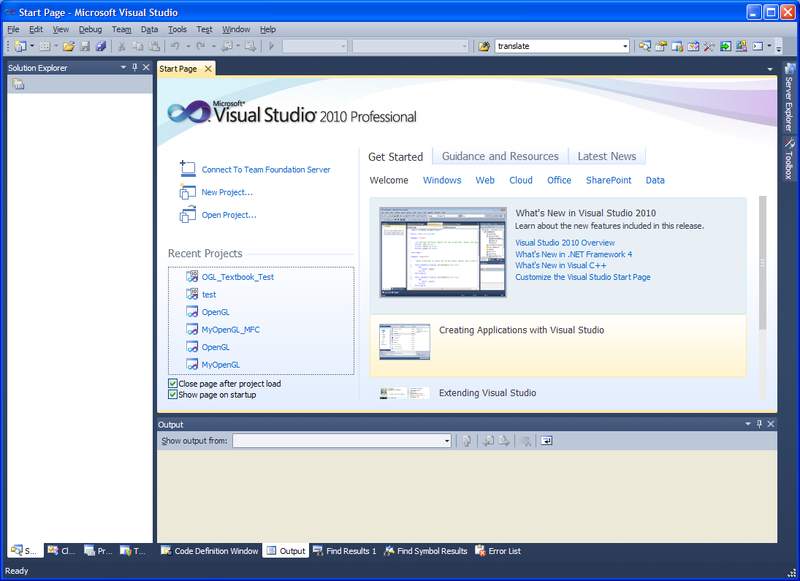 When you first start Visual Studio, this is the "Start Page". Right Bottom: Feedback Area. Depending on your current activity this area might show code definitions, compiler output, or debug information. 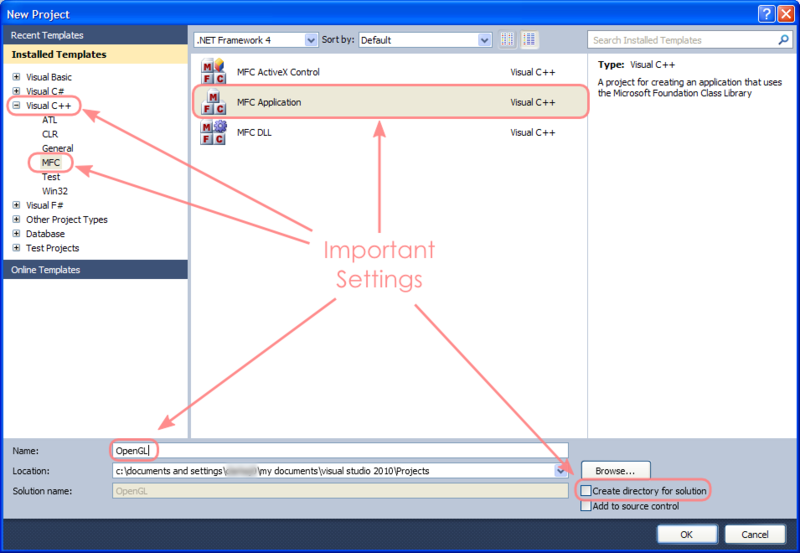 Left: Project Management Panel: contains Solution Explorer (default), Class View, Property Manager, and Team Explorer. Choose the one you want with tabs at the bottom. Solution Explorer shows you the files in the project or solution that you are working on. 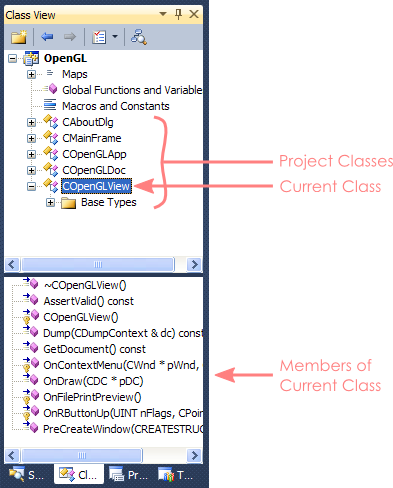 Class View enables you to see the class hierarchies in your project. Property Manager can be ignored for now. Team Explorer can be ignored for now. If your window differs from the one pictured, you can still probably find the same elements. Most likely the Solution Explorer and Property manager will be on the left. The exact layout does not matter much. In the Projct Management Panel, click on the "Class View" tab, and the class hierarchy will be displayed. There should be five classes (CAboutDlg, CMainFrame, COpenGLApp, COpenGLDoc, and COpenGLView) automatically created for the OpenGL project. One of them, called "COpenGLView", will be particularly interesting to you because the main task of this lab is to add functions into this class. At this point, you might want to compile the application (which of course does nothing yet) just to make sure there are no errors in your building process. Click on the "Class View" tab underneath the "Solution Explorer" on the right-hand side. Expand the "OpenGL" project by clicking on the "+" to the left of "OpenGL". You will now see the five classes that have been automatically created. Expand the "COpenGLView" in a similar way. You will see some member functions that have been automatically created including OnDraw and PreCreateWindow. 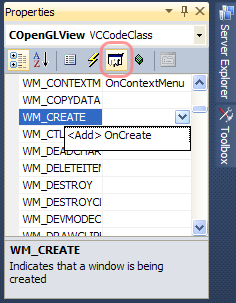 To add functions for these messages, first ensure that you have selected "COpenGLView" in the "Class View", then press Alt + Enter to open the Properties window. It will open on the right of the screen. You will notice that in the Properties window, the properties of "COpenGLView" are listed. The goal is to list appropriate messages and select functions. Follow the below example for all four messages. You will see a listing of messages. Notice that a drop-down arrow appears. Click on the arrow and select " OnCreate". You may notice that, OnCreate is added into the "Class View" window. Remember that the system can only create a skeleton for the member function. It is your responsibility to insert computations into the relevent member functions. Click on COpenGLView again to add the next function and repeat as needed. It is very exciting to run this little window's program if it is your first Windows program. A new window should be displayed in a few seconds. There are three menus: "File", "Edit", and "Help". These are the minimum options automatically created by your VC++ system. Don't be surprised; the inside window is totally blank, because we haven't written any functions yet. So far what we have created is all standard MFC stuff. It has nothing to do with OpenGL yet. To connect to OpenGL, we have do a few things first. Then we may use functions from OpenGL library. #include "gl\glut.h"   // replace this with "gl\freeglut.h" if you installed freeglut. To add the above contents, you have to first find the desired header file. This is a good time to learn how to navigate around the files of the project. Click the "Solution Explorer" tab (in the middle right), the "root" folder should be displayed. Click the "+" node, and subfolders should be displayed. Two of them are of interest to you at the moment. They are "Source Files" and "Header Files". Click the "+" node to the left of the "Header Files" folder, you will see a number of header files are listed. One of them is "OpenGLView.h"
Double click on this filename. The contents of the "Editing Window" change to the contents in this file. Now, you may go ahead to insert the above contents at the very beginning of this header file. Remember to save the document before you close this Editing window. The following was necessary in VS2008 and earlier. If it causes problems in VS2010, then everything should work if you remove the Additional Dependencies. A dialogue box will appear similar to below. In the sub sections of "Linker", click "Input". You should now see "Additional Dependencies" on the top right-hand side. Note: change glut32.lib to freeglut.lib if you installed it. At this point, you might want compile your application again to make sure that everything is right so far. For now here are the changes you need to make to the two files. The parts you will work with are highlighted in red. // You should have already added these lines. // You will add the following stuff!!! // and search filter handlers and allows sharing of document code with that project. // You will add stuff here!!!! // You will add the following line !!! // You will add stuff here !!! // include CS_PARENTDC for the class style. // You will add stuff here!!! // You will add some stuff here!!!! // You are to add all new functions here !!!!!!!!!! // Can we put this in the constructor? // Be sure to add the init, resizing, and drawing functions from the lab notes! Don't forget to add the OpenGL code from last lab to the OpenGLView.h and OpenGLView.cpp as well! Once you have modified the above two files, you can compile and run the program. To clean up your project for submission delete all Debug folders in the project and delete all sdf files. They are rather large (in some cases > 30 MB) and the .exe file in the Debug folder will be rejected by many spam filtering systems. Besides, you will get them back the next time you compile your program. All the source files should be small enough to put on a floppy disk. Another option is to ftp the whole project folder (minus Debug folders) up to hercules. To open an existing project, on the hard drive, you can change to that directory (For instance, My Documents\Visual Studio 2010\Projects\OpenGL) and double click on the solution file (OpenGL.sln), which looks like the following: However, this approach will not give you the "Start Page" Tab. Follow the directory structure to find your project directory (OpenGL). The project should be up and ready to go (just as you left it).